Ciaran specialises in assisting those who have suffered life changing injuries to the brain (adults and children) and spinal cord. He has also acted for those who have suffered amputation, severe orthopaedic and brachial plexus injuries. He often initially sees clients at major trauma centres, hospitals or rehabilitation units throughout the country and also sees clients at their homes or if it is more convenient, he can arrange an appropriate venue close to their home. 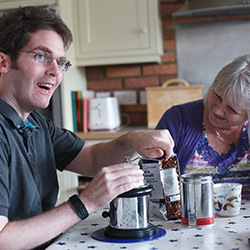 Ciaran is able to see clients at Hugh James offices in London and Cardiff. Ciaran currently sits on the editorial board of the B21 magazine – for those with brain and spinal cord injury. He is a Spinal Injuries Association and Headway accredited solicitor. Griffiths v Secretary of State for Health  EWHC 1264 (QB) – Spinal Cord Injury. Hughes v Eastwell Manor  (QB) – Stroke following a beauty therapy treatment. Runacres v Mills (QB) – Severe Brain Injury to a City Broker following a road traffic accident.